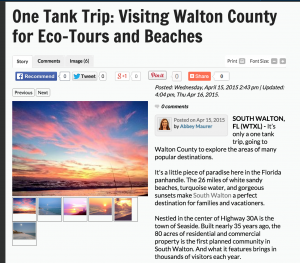 SOUTH WALTON, FL (WTXL) – It’s only a one tank trip, going to Walton County to explore the areas of many popular destinations. It’s a little piece of paradise here in the Florida panhandle. The 26 miles of white sandy beaches, turquoise water, and gorgeous sunsets make South Walton a perfect destination for families and vacationers.